Lately, my new Bus Mate has been a test Ribby Cardi; so far, the fronts, and 1.75 sleeves are done. Last night on my way home from work, a fellow passenger took more than a passing interest in my work. His Happy Hour, I believe, had been going on since maybe Lunch and now it was Dinnertime, and like millions of inebrieated folk who’ve gone before, it was time to SING! About my SCARF! Did this have the intended effect on me (which I assume was to enable me to relax and provide a metronome like cadence so I could knit the *Scarf* faster…)? Because I’d reached my breaking point on the concept of ye olde *K1P2*! K2P2, maybe. 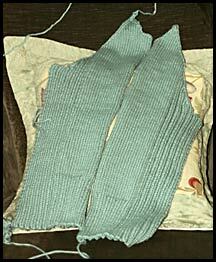 The Ribby above is 2x2x3x1 ribbing. BUT, this delightful looking cardi is a sincerely dangerous piece of work! 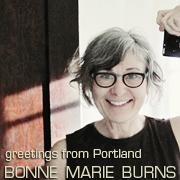 It is from the delightful designers @Rebecca. Never have I found a company with more titillating and innovative designs. I delight in their offerings. I want to make and wear most of them. I am tortured by their translations. I am mentally squeezed by the brevity of the length of the patterns. How can you take a complicated, extremely shaped, lacy creation and distill the instructions down to about four paragraphs? I know, I know, the fabulous European knitters don’t NEED any hand holding, BUT WHAT THE ****! I’m just wondering who the H is supposed to be able to understand these translations? Now as a writer whose A** has been flamed hither and yon on some of these same issues, I have to say kindly: WHAT THE ****! Now, I’ve routinely done these things on other garments with NO PROBLEM! But on this one, the directions were so convoluted it put me on the ropes over and over. I’d get one set of instructions right then blow the next. 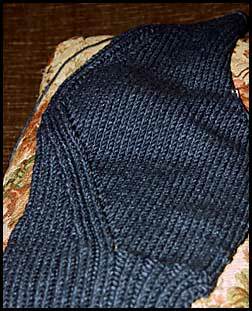 Get the neckline squared away and miss the beginning of the armhole decreases. Score on the AHD and totally screw up the lace pattern. Now, I know that patterns need to be brief to keep production costs down. I know some designers take huge personal pride in condensing their instructions as much as humanly possible (and why this is such a point of pride is beyond me). But please, people, we knitters are paying through the nose for the book to begin with, it comes with NO pattern support, and we really, really WANT to make your stuff because it’s so brilliant! Why make it SO HARD for us to do? Give it a TIME OUT!